No matter what the profession or subject matter, having someone you respect provide feedback on your work is a valuable experience. It provides you the opportunity to step out from behind your own eyes and view your efforts through someone else's. As a photographer, I find it equally valuable to critique the work of other photographers. It allows me to see how other people approach composition and challenges me to determine how I might have framed the shot had it been me behind the lens. I was recently fortunate enough to have one of my images selected for a critique. 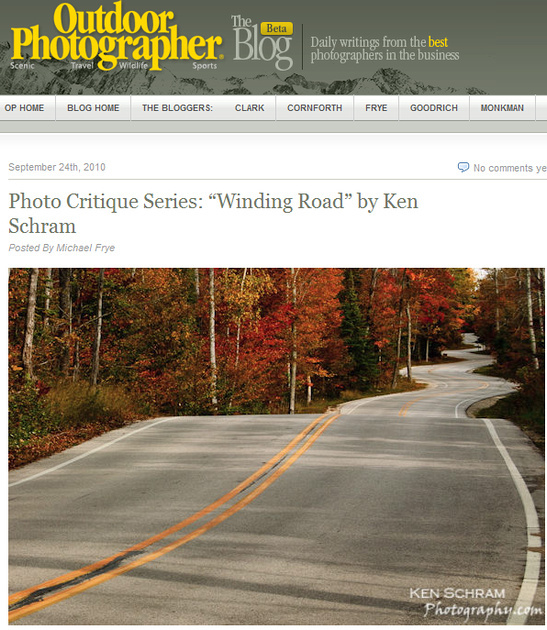 Michael Frye, a professional nature and landscape photographer selected my image "The Winding Road" for a post in his "Photo Critique Series" in Outdoor Photographer Magazine. If you follow the blog, you'll probably recognize the image as I just included it in a post a few weeks ago. Michael's critique provides some alternate compositions of this image and a valuable narrative as to why one might select each of those compositions when presented with a scene similar to this one. I'd encourage you to take a moment to read the critique as there are some valuable takeaways. If you are looking for other opportunities to have your work critiqued or to critique the work of others, Flickr provides a wealth of opportunities to do just that. A quick search within groups for the word "critique" will show you just how many. You may also look for local photography clubs or even just sit down with a group of fellow photographers from time to time to review each others work. One final word of warning. DON'T let feedback provided by critiques change your direction as an artist. We all seek acceptance from others and like to hear praise whenever it's given. If someone's opinion differs from yours, however, that doesn't mean you're wrong. Listen to what others have to say, determine if you can use that information to advance and take from it what you can. If you chose to ignore it, that's perfectly fine too. Stay true to yourself above all else.